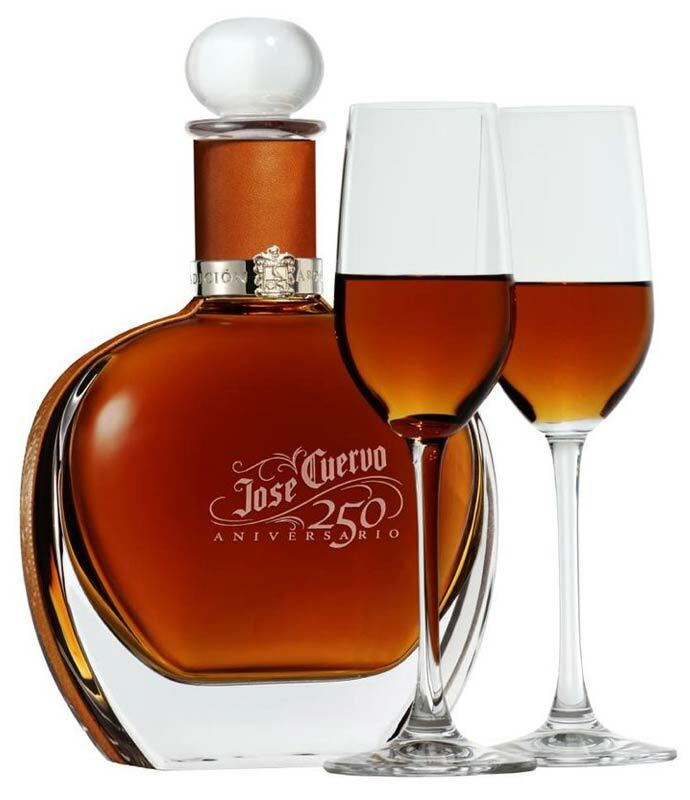 To honor 250 years of history, Casa Cuervo is releasing Jose Cuervo 250 Aniversario on November 2, 2009. This will be one of the most exclusive tequilas ever made. The pedigree is insane: It’s made with a blend of 5-, 10-, 15-, and 20-year-old anejo tequilas, plus a selection of blanco tequila uncovered in the Cuervo cellars that had been stored there for 100 years. That blanco was aged for three years in oak barrels before mixing with the rest of the tequilas in the blend. Finally, the entire blend was aged a second time in sherry casks for an extra 10 months. The resulting elixir is put into a hand-blown decanter and a custom box. Expected retail price of $2,250 US. The 250 Aniversario edition will have only 495 bottles produced. Each box will also have a reproduction of the Spanish land grant for the original Cuervo agave plantation. The special bottling commemorates the historic birth of tequila production and the establishment of 10 generations of Cuervo family tradition: on November 2, 1758 King Carlos of Spain granted Don Jose Antonio de Cuervo the first plot of land on which to cultivate agave. In anticipation of the 250th anniversary, expert Jose Cuervo jimadores planted blue agave on the same land granted in 1758 and used these estate-grown plants exclusively in the production of Jose Cuervo 250 Aniversario. This precision was utilized to ensure every decanter maintains a direct link to this historic event and pays tribute to the centuries of labor and family passion that led to the creation of an industry. Jose Cuervo 250 Aniversario is a 100 percent blue agave Extra Añejo Tequila blended from the most select tequilas in the family's reserve and aged in a unique double-cask method. The best of these Extra Añejos, aged in toasted new American Oak barrels for a minimum of three years, were selected by the master distiller and blended together to achieve a superior tequila. The distinctive blend was then finished for 10 months in Sherry casks originating from Spain. The decanter was inspired by the original glass bottle first used by Jose Cuervo to ship Tequila to towns throughout Mexico. Each comes packaged in elegant oak gift box and will have its sequential number etched into the glass, certifying the product's rarity and authenticity.